Mushrooms are used in a wide range of recipes, and some types of mushrooms are considered delicacies. 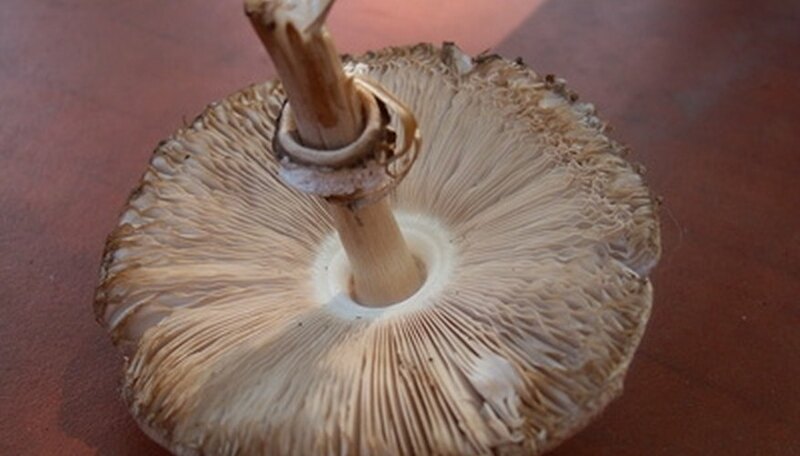 Gourmet mushrooms are often expensive, but many mushroom types can be grown at home at a significantly lower cost. One method used to grow mushrooms at home involves mushroom grow and spawn bags. These bags prevent contaminants from tainting the mushrooms while they are growing and provide a consistent environment for the mushrooms during their critical early development days. Pick up the grow and spawn bag and gently break up the material inside of it with your hands. It does not need to be completely broken up, but should be crumbled into smaller chunks at the very least. Do not open the bag. Apply rubbing alcohol to a cotton ball and wipe the patch on the bag intended for inoculation. Discard the cotton ball. If the bag contains more than one inoculation point, use a different cotton ball to sterilize each one. Wipe the needle of the syringe with another alcohol-soaked cotton ball to sterilize it. Allow the alcohol a moment to evaporate before beginning inoculation. Insert the needle through the inoculation point on the bag at an angle, ensuring that the tip enters the growth material in the bag. Press the plunger on the syringe and inject 6 cc of spore solution into the growth material. Remove the needle and wipe it clean with an alcohol-soaked cotton ball. If you are inoculating a large bag or a bag with several inoculation sites, reinsert the needle at a different angle to inject another 6 cc of spore solution into a different portion of the growth material. Cover all needle holes with clean surgical tape once finished. Place the bag in a cool and moist environment. Allow the mushroom spores time to cultivate; this may take up to four weeks depending on the type of mushroom being grown. When half of the growth material has turned white you may break up the material gently to increase the speed of growth. Punch small holes in the bag using an alcohol-sterilized nail or knife once the growth material starts turning white if you are growing oyster mushrooms or similar mushroom types that grow attached to vertical surfaces. This will allow the mushrooms to form on the outside of the bag. If you are growing mushrooms that grow on their own stalks, do not puncture the bag. Harvest the mushrooms by cutting them off of the outside of the bag (if the bag was punctured) or opening the bag and carefully removing them from the growth material. Spraying the remaining growth material and inside bag surfaces with a light mist of purified water then resealing the bag may allow you to make two or more harvests from a single growth. Grow and spawn bags can be made at home using wild bird seed and a pressure cooker. Allow the bird seed to soak in water for 12 to 24 hours, then drain and rinse. Use the seed to fill bags designed for mushroom growing to a depth that is halfway to the inoculation patch, then seal the bags with surgical tape. Place all of the bags that you have prepared into a pressure cooker and 4 quarts of water; maintain a pressure of 15 psi for two hours, then allow the cooker to cool and remove the bags. Remove the surgical tape and seal the bags with a vacuum sealer to prevent contamination. Mushrooms that appear to be molded or which develop red or black patches should not be eaten. Mold and other contaminants can cause illness or death if ingested.